Mr Gideon Falter, 34, who runs the Campaign Against Antisemitism (CAAS) was the chief witness for the Crown Prosecution service’s (CPS) against the British minstrel Alison Chabloz. On January 10th at Marylebone Magistrate’s Court we heard him swear the oath, to tell the truth, the whole truth and nothing but the truth. He then proceeded to give the court various hearsay conjectures, about what effect Ms Chabloz’ songs might be exerting, upon unspecified persons. He averred for example that they were ‘spreading anti-semitic hatred’ and were ‘inciting to racial hatred.’ The Court was not given evidence for this, nor advised where or in whom these emotions were being generated. Should he not have called witnesses to testify in support of these conjectures, or better still a psychologist to affirm that they were or had been generated? 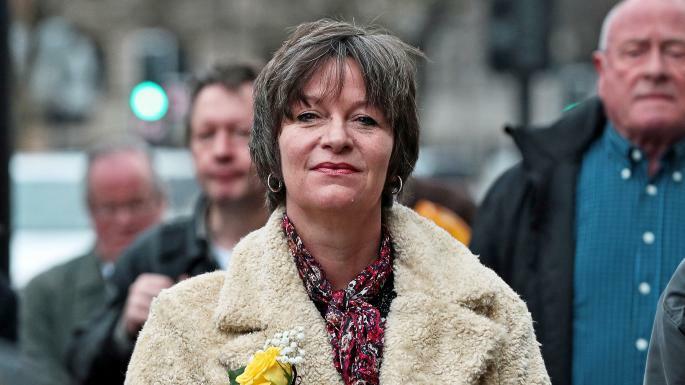 The Court was advised of one offensive performance by Ms Chabloz, where she sang her songs ‘(((Survivors))) and ‘Nemo’s anti-Semitic Universe’ namely the London Forum in 2016 (September 24th). A problem here could be the signs of mirth and riotous applause in response to the songs: did this really show what Mr Falter had been alleging, or if not, what did? She was recently introduced as ‘The brilliant comedienne and singer/songwriter Alison Chabloz,’ by Richie Allen, on his popular radio show (18 January). The point of satire, is that it makes people laugh. Britain has a long tradition of satire from William Hogarth in the 18th century to Private Eye in the present time. Its future is surely at stake in this trial. We live in a society where just about any sacred belief is liable to be satirised for entertainment value, and those being satirised have not generally sought recourse to legal action. When punk-rock bands savagely mocked the Royal family for example, no-one prosecuted them. Last year, at least nine people a day were being arrested in the UK on such dubious grounds. Annoying someone or causing distress has never been viewed as a crime — until now. The Communications Act was basically designed for the media. In contrast, songs posted up on the Web are only heard by persons who choose to listen. One exercises that choice by clicking the ‘play’ button. Ms Chabloz has not ‘communicated’ anything in the sense defined by that Act. Normally, if a Youtube video is found to be disturbing, a complaint is put through to Youtube, rather than the person who has uploaded it. Now Ms Chabloz’ songs have either been deleted or given protective warnings by Youtube, which further complicates the question, of how and to whom she is supposed to be causing offence. The Defence lawyer Adrian Davies had suggested at an earlier hearing that his client’s songs might be ‘offensive’ but not ‘grossly offensive,’ and that remark was reiterated by the judge in the present hearing. That is surely so: it’s not as if they were snuff movies, or featured depraved or perverted acts, or personally defamed anyone living — except for one person, Irene Zisblatt who claims that she swallowed diamonds while she was at Auschwitz. The court discussed her case, with Mr Davies pointing out that the official Yad Vashem Holocaust centre in Israel had cast doubt upon the veracity of Ms Zisblatt’s story in her book The Fifth Diamond. It features of course ze evil Nazis ripping babies in half, making lampshades out of human skin, etc. Was this not a legitimate target for satire, Mr Davis asked the Court? Some have commented that British politics would hardly be able to function if a distinction was liable to be made between ‘offensive’ and ‘grossly offensive.’ How is the law supposed to discern such a thing? Others have wondered if it is really appropriate for the CAAS to be registered as a charity, i.e., a tax-exempt NGO, which goes around suing people. The CPS had not wanted to take this case, but was pressured by the CAAS to do so. That applies both to the pending case of British ‘nationalist’ Jez Turner as well as Ms Chabloz: in both cases the CPS had no inclination to prosecute, but arm-twisting by the CAA made them do it. In fact, the CAA works for a foreign power: its first action upon being founded in 2014 was to intimidate the Trycicle Theatre in Cricklewood so they gave up their BDS policy on Israeli goods. Why should a group specialising in legal intimidation be awarded tax-exempt charity status? The second witness after Mr Faulter was Stephen Silverman, the CAA’s ‘Director of Investigations and Enforcement.’ Under examination he confirmed that the online character ‘Nemo’ who had been persistently trolling Ms Chabloz, was none other than Stephen Applebaum, the CAAS’s ‘senior volunteer.’ For the last two years she had received some quite intense twitter threats and curses from this character — thus on her website ‘Nemo’ declared: ‘Even if you are acquitted, we will still go after you.’ Earlier, in the first court hearing of this case in December 2016, Mr Silverman admitted that he had been tweeting as ‘Bedlam Jones’ who had likewise been making quite intimidating comments. So, this is a case that could work a lot better the other way round, with Alison as the innocent injured party and CAA personnel as guilty of harassment and victimisation. Clearly, the CAA needs to be stripped of its charity status. As a general comment, one can either post envenomed tweets against someone or sue them, but it may be inadvisable to try both. The case is adjourned until March 7th. It aimed ‘to make provision about the regulation of the provision of electronic communications networks and services … to make provision about the regulation of broadcasting and of the provision of television and radio services, etc.